What motivates us at work and does it depend on age or gender? What motivates people at work? What factors make you want to stay at your current employer? What factors make an employer more attractive? Are there differences between these factors depending on age groups, gender, having kids, the type of work you do or are the main factors always the same? To answer these questions, Equilibre organized a first creative Hackathon end of 2017 with around 40 participants. The preliminary results of such a small sample showed Corporate Values being the most important factor followed by Interhuman Relations. As neither salary nor office space came up, a new study needed to be conducted which was going to be more representative of the population. Thus, the following study, financially supported by the Ministry of the Economy, was built over a 3 months period and then responses were collected over a 4 months period (September-December 2018) with the outcome of 382 valid answers. So what do the happiest people have in common? People declaring to be the happiest at work are the ones who have the best interaction with their co-workers. With a positive correlation of 0,39, this is clearly the most influencing factor at work and is backed up by the other responses given. A second interesting factor is kids (correlation: 0,26). The study assumes that the fact that you need to satisfy two competing demands: parent and employee, is causing stress on people. This may be an explanation for the positive correlation of not having kids and happiness at work. 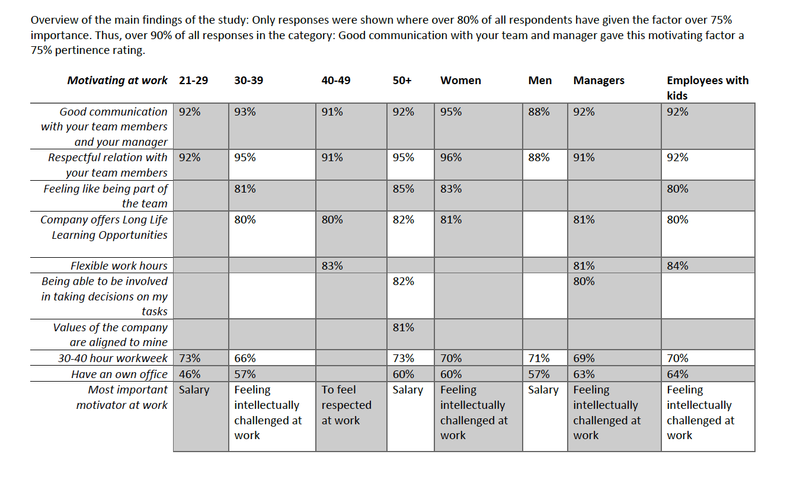 Almost all subgroups of respondents are aligned on communication and respectbeing the main motivator at work. A more detailed chart can be found below. Most employees would prefer an 80% work and 20% meetings schedule as well as a 30-40 hoursweek which clearly points to the want to not have to do overtime. An own office is still the preferred setup for most respondents, no matter their age, qualifications or gender. When it comes to long life learning opportunities, in line with the above, all respondent categories rank Skills which help me to work better with my colleaguesand within the team as the most essential learning opportunity. Finally, we asked the respondents what traits the perfect manager should have, and all categories came back with clear communication with the teamas main and most important characteristic. When it comes to the main factors which motivate you at work, different age brackets report different motivators as we detail below. What remains open is the question how companies can help employees better communicate with each other and how they can help their employees respect each other. The benefits for the companies are clear: More motivated employees means better customer support and happier customers. All of this clearly has a positive impact on the company and its financials but also on the people. Less stressed and happier people at work, means less stressed and happier people on the road (less accidents), happier couples (less divorce), happier parents (better grades for kids) and many other benefits. Society as a whole can benefit from happier people. So, the question we need to ask ourselves is: Is this something that can be done on the company level or do we also need to look at a broader society level such: school and home values, media even maybe? Thus, the research does give us pertinent and important answers on the topic of motivation at work: Communication and Respect, two basic human needs, which are at the forefront of motivation at work. However, it cannot give clear answers on how to achieve those within a company setting. As the subgroups defined in the study do show differences in motivation factors, the importance of those factors is less pertinent than Communication and Respect. - Employees with kids value “to be intellectually challenged at work” more than “having flexible work hours”. Thus, this study contributes to understanding motivating factors at work with positive possible repercussions on society overall. Even though a lot of detailed questions still remain open, the study helps to point us in the right direction for the next steps which will include the two main topics of communication and respect. How do we foster communication within companies? Do software platforms such as Slack help or hinder communications? How do we define communication? Is it information flow of important corporate decisions, team members talking about projects and keeping everyone up to date, hierarchical reporting or social gathering opportunities? A more in-depth study in how companies foster communication or not needs to be conducted to better understand the subject and provide guidance to employers and employees. A recurring theme that we have already seen at the Creathon level, is respect for each other. This is a topic which is not only important on the company level but rather on the society level. How do you ensure or foster people to respect each other? How do you define respect? Is it dependent on culture or will we all have the same definition? The topic of respect at work will thus automatically trigger a debate on respect in society. In order to dig deeper, Equilibre will host a new Creathon on the topic of Respect at Work. This first step, as for Motivation at work, will help narrow down the topic into subtopics which should be addressed research-wise. Parallel to this, a possible study into respect in schools could be a great addition to better understand when the craving for respect starts and feels underperformed.